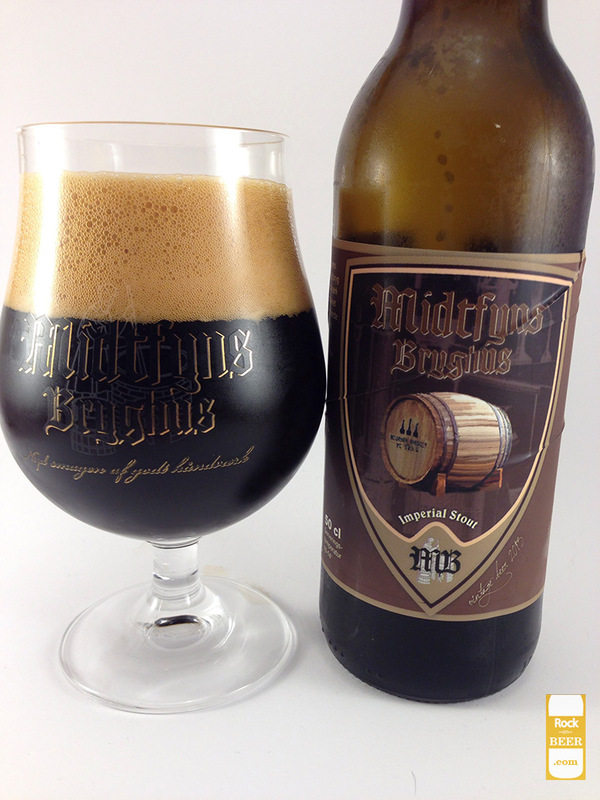 Midtfyns Bryghus released four imperial stouts to commemorate the closing of their original brewery where they brewed 1000 batches. The beers released are numbers 0997, 0998, 0999, and number 1000. They are each different, licorice and fennel, chili, bourbon, and the final beer brewed in their Broby facility a walnut and walnut leaf imperial stout. So this is the one I have been saving as it is my most anticipated of the four. I love bourbon stouts. Can't get enough of them. Which is a paradox as I don't really like bourbon at all! I just think it is the perfect flavor to accompany a good roasty big imperial stout. So I have high hopes for this bourbon oak aged beast. Pours very dark, no surprise there. Not as aggressive a head as the previous three beers, two fingers and it settles out really quickly. The smell is very nice, but not as complex as I thought it might be. The main tone is rich chocolate and vanilla/oak. A little bit of licorice and dark roasted malts come through. A very rich smell. I have been tending to compare these to candy...so ummm, this one is a chocolate bar dipped in bourbon. Is that a thing? it should be. The taste is superb. It does start with a powerful burst of natural licorice but it is almost instantaneously gone replaced by smooth chocolate roast and vanilla. This is with a little touch of warmth, at its coldest it was a smooth bit of vanilla chocolate. Nice but with almost no nuances. Now that the heat is on the flavor is opening up into something special. Even more warmth settles out the licorice taste into a nice undertone along with a subtle coffee and a warming alcohol flavor. This has the most alcohol in the taste, besides the walnut stout, but here it is less a flaw and more something that adds character, especially if you keep it around the 10 degree C mark. My last few swallows were all coffee and vanilla. Has a pretty good body, my only complaint really would be I wish it was a bit thicker and more viscous. Little high on the carbonation but it settles out quickly. Long lasting vanilla and oak woody aftertaste. So in my opinion the best of the whole bunch. Now like many of my views I am a bit biased as bourbon imperial stout is one of my favorites. This one tends to capture a little more flavor, having a bit lower alcohol then the average bourbon stout. I can say it was a true joy to drink this one, and even though I have been told these stouts will not go into full production, I will keep my fingers crossed on this one.